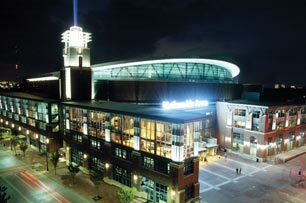 Nationwide Arena, home of the Blue Jackets, was a catalyst for the revitalization of Downtown Columbus. It has been over a year since revelations first surfaced that the Columbus Blue Jackets have been hemorrhaging money for the past seven plus seasons. The losses, which do not include any incurred during the 2009-2010 season, add up to approximately $80 million, as a result of the franchise’s lease agreement to play in Nationwide Arena. Last fall, the Columbus Chamber of Commerce contracted Ohio State Professor Emeritus of Finance Stephen Buser to conduct a report to determine the financial viability of the ailing National Hockey League franchise. The Blue Jackets are one of just two teams in professional sports currently playing in venues that are privately financed — the other being Major League Baseball’s San Francisco Giants. The difference is the Giants pay only $1.2 million a year in rent to the San Francisco Port Commission, as part of a 66-year lease at AT&T Park. San Francisco also collects revenue from naming rights fees to the tune of $50 million over 24 years. The Blue Jackets do not. The Blue Jackets’ lease arrangement requires them to pay roughly $5 million yearly in rent to play in Nationwide Arena. It is part of a 25-year lease with the Columbus-based insurance company to help recoup approximately $106 million of the cost it took to build the Arena. In addition, the Blue Jackets lose between $4 and $5 million a year in management fees and receive no revenue from naming rights fees. All together, the Blue Jackets have been losing an estimated $12 million annually. Blue Jackets President Mike Priest disclosed the team’s losses in a statement last season. But this is much more than a building or team problem. This is an entire community problem. Turn back the clock 15 years and the area between Vine Street and Spring Street, just west of High Street, was little more than a wasteland. 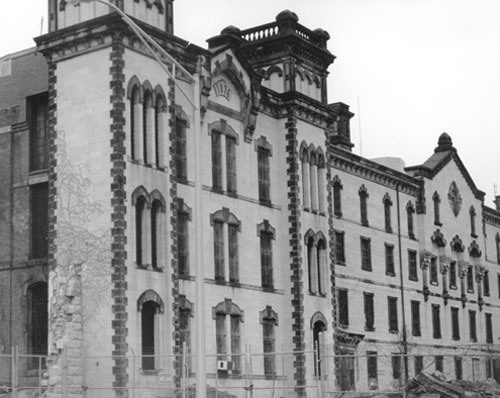 It was home to the old Ohio Penitentiary, which had stood empty for nearly 20 years. There were no ballparks, no amphitheaters, no fine dining, no luxury town houses. The gateway to Downtown Columbus was an out-of-service penitentiary. Today, that same site is now home to one of the most vibrant communities in Central Ohio: The Arena District. Since the Blue Jackets inaugural season in 2000-2001, the area around Nationwide Arena has experienced a complete revival. Restaurants and bars began popping up on all sides of the arena. Soon a movie theater and gym followed. Then came luxury condos and town houses, and it all culminated last year with the opening of sleek new Huntington Park, the home of the Triple-A Columbus Clippers, minor league affiliate of the Cleveland Indians. Presently, there are over 170 businesses that call the Arena District home, employing over 5,500 workers and generating a combined $1.6 billion in revenue yearly. The old Ohio Penitentiary, which laid dormant for 20 years before the construction of Nationwide Arena. According to Buser’s report, the Arena District generates approximately $30 million in tax revenue annually for the City of Columbus. The report suggests that number will double within the next decade. “That [report estimate] is extremely conservative, just because we only took a tiny, tiny fraction of the overall sales,” he said. Despite the overwhelming positive impact the Blue Jackets and Nationwide Arena have had, there has been little progress in alleviating the franchise’s financial woes. Last spring the Blue Jackets and Nationwide began negotiating with the General Assembly, which they hoped would result in the public purchase of the arena by means of a sales tax increase. However, the ‘sin tax’ needed approval from the Franklin County Commissioners to be enacted and they denied the increase. At that point, the Chamber stepped in and commissioned the study with Buser heading it. Buser’s report determined that there were essentially three options for the Blue Jackets: increase revenue from the private sector, create an alternate private ownership structure, or explore public-private ownership options. The Blue Jackets took their first step toward relieving some of their financial difficulties when they agreed to a joint-management deal with OSU and the Jerome Schottenstein Center earlier this spring. Until that point, the two “A” venues were competing for all the acts in a “B” market — not exactly the best financial plan. The Blue Jackets avoided another potential hurdle when Franklin County voted to move the location of a new casino from the Arena District to the West Side in the May Primary. But there is still quite a ways to go to ensure the Blue Jackets can continue to operate. While Buser’s report favored no specific solutions, he did offer some personal insight — sell revenue bonds to the public. Meanwhile, Marsh and the Chamber will continue to do their part to keep the organization afloat.